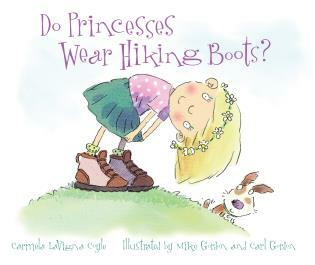 Carmela LaVigna Coyle, author of the popular Do Princesses book series, is super pleased about her latest book for boys and girls alike. Her son Nick, with his fearless plush shark, Swimmy, was always creating something adventurous out of cardboard. She recalls, "And off we'd go, saving the world inside Nick's 'hi-tech' spaceships and submarines." Now, she's hoping children everywhere will discover that being a super hero may not be all that far-reaching after all. She lives in Denver, Colorado. Visit her website at www.carmelacoyle.com. Mike Gordon’s award-winning illustrations span fiction, non-fiction, entertainment, and educational books worldwide. He lives in Santa Barbara, California. ...[A] good character-building book to help children begin the process of discerning right from wrong; good from bad; strength from weakness. 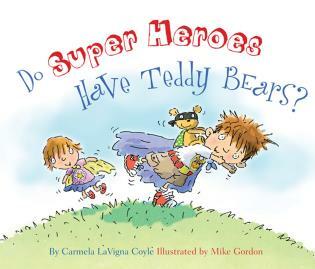 Gordon’s gently goofy cartoons are always fun, portraying an idyllic existence that includes lots of outdoor adventures, an impressive array of pretend play props, an improbably expressive teddy bear, and a pet dog with superhero aspirations of his own. From making blanket capes to cardboard spaceships, this book is a nostalgic romp through a child’s imagination. Funny and charming, with a great message about being an everyday hero, it will surely win the hearts of youngsters and their adult counterparts. Bright, interesting, and comical illustrations with whimsical touches highlight the text well. 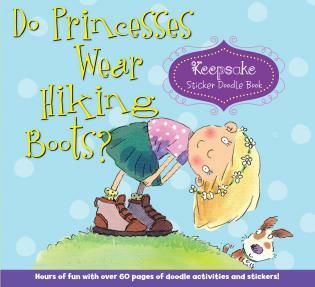 Coyle's rhyming couplets keep the question-and-answer narrative rhythm rolling, and Gordon's cute cartoon-style kids keep up the appeal with lots of visual KAPOW! Little boys and girls that are gobbling up my Batman and Spider-Man (yes, girls read comic books, too) will love this title, and I think their parents will find a warm, comfortable book to share with their children. I have a feeling this title will fly off the shelf. Super heroes inspire wonder with their amazing feats, but what about everything else? Do Super Heroes Have Teddy Bears? 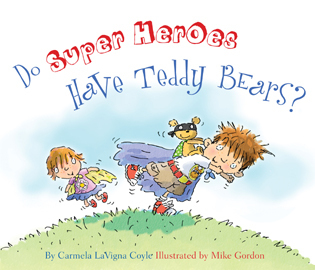 is a children's picture book from Carmela LaVigna with art from Mike Gordon. [The book follows] a young boy [who] ponders what super heroes face in their everyday lives as he tries to embark on his own adventure of saving the day and living life simultaneously. Do Super Heroes Have Teddy Bears? 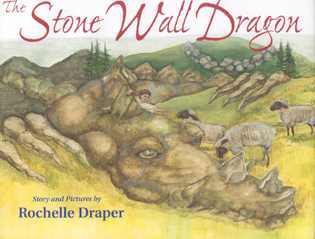 is a fun read-along storybook for parents and children; highly recommended.